The Cultural Gutter (2011) is published by Carnegie Mellon University’s ETC Press and features essays by Gutter Founding Editor and Retired Games Editor, Jim Munroe; Science Fiction and Fantasy Editor Emeritus, James Schellenberg; Romance Editor, Chris Szego; Screen Editor Emeritus Ian Driscoll; and me, current Evil Overlord and Comics Editor, Carol Borden. The print version comes with excellent infographic illustrations by artist E.J. Lee. You can find the print version at Lulu or Amazon . It’s also available in several digital formats. Call it Pop Culture, call it Disposable Culture, call it Trash Culture. Whatever, it is OUR culture, and Carol Borden and company give it more than just geek love, they give it proper respect, in the form of considered opinion, deep analysis, and intelligent wit. I found the Cultural Gutter by accident, while I was trolling for information about an author who was successful, but not well-regarded by literary critics. I came back to the site regularly, because reading the Cultural Gutter is like attending a party where everyone is interesting, witty, and well-informed. I enjoy the articles both when I know nothing about the cultural artifact in question, and even more when I do. 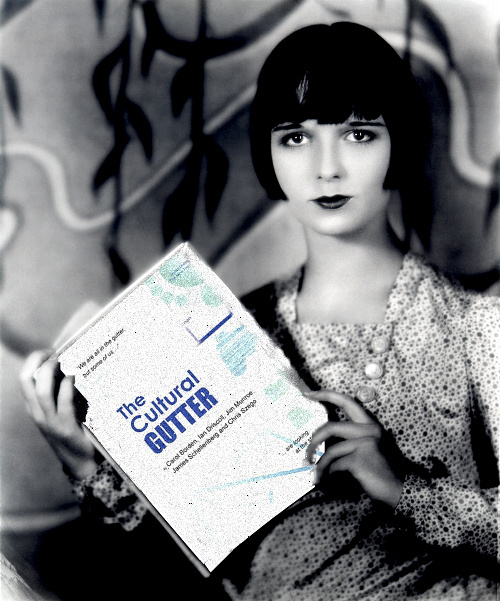 I rely on the Cultural Gutter’s dedication to getting down and dirty to sift through the refuse and debris of un-popular culture past, present and future on a regular basis.